You are here: Home / Spiritual Disciplines / How Can 40 Days Renew and Refocus Your Heart? I never imagined what a difference 40 days could make. What one season of sacrifice could do to change my heart and strengthen my faith for the next step of my journey. How one practice for just over a month could form a lasting, life-giving habit. Lent used to be a season of rules and restrictions to me. Days without meat, giving up all the good stuff, like sweets or coffee. Looking for any loopholes in the rules to sneak a bite of something yummy. I didn’t really understand why we did the things we did. What difference did it make if we ate steak or fish? How was that even relevant to faith? The first year, God had been calling to begin stepping into a new career path. I’d been resistant because I didn’t have much time between family and my current job. As Lent approach, I felt God asking me to get up earlier in the mornings for this one season to begin working in this new area. Just for 40 days. Make this sacrifice of valuable sleep for an opportunity to allow God to work through me. Not only did he use that time to set in motion a new path in my life, but these early hours became a lasting habit that’s allowing me to transition. The next year, I’d fully committed to this new path, but I’d become so focused on working in these early hours that I’d forgotten to spend that time with God. As Lent approached, I heard him whisper that he wanted more of me. He wanted my first 30 minutes – no work, no study; just time in scripture and prayer. It meant becoming more efficient at some tasks and cutting out others, but those 40 days were a time of spiritual rebirth and renewal. Even better, giving God my first 30 minutes has become a habit, a life-giving part of my day. Another year, I became aware that my prayers had become very self-focused. I was working to discern the path ahead of me, but I felt God asking me to lay down those questions and shift my focus. For 40 days, he asked me to stop praying for myself. Instead, I focused all my prayers on other people. This wasn’t an easy practice, but a shift I desperately needed. As I turned my focus to others and stopped looking so hard for my own answers, the path before me began to come into focus. Is God calling you to a season of refocus and renewal? Lent has become a season of letting go of the thing I’m holding most tightly. 40 days to give God the first fruits of my time and focus, so I can become less of me and more of him. It’s a time of course-correction, getting my life refocused and rebalanced to follow where he leads. Shedding the bad habits I picked up through the year, so I can once again run the race unhindered. Whether it’s Lent or any other time in the year, what difference could 40 days make in your life? Have you picked up any habits that distract you from God? What is God whispering to heart about where he wants a change in your life? How can 40 days bring spiritual rebirth and renewal to your life? Do you need a spiritual renewal in your life? Have you drifted from God, shifted your focus from him, picked up bad habits? Will you consider giving the next 40 days to God? Make one sacrifice of your time and focus, giving him your best for just 40 days. Then, allow him to work through you, renewing and refocusing your heart. How to make the most of your 40 days with God. If you’re not sure what discipline God’s calling you to in these 40 days, start with prayer and scripture. If you aren’t hearing God in your life today, try spending more time in scripture. The Bible is God’s Living Word and one of the best places to connect with him. Carve out 30 minutes each day and spend that time with God in scripture and in prayer. Not sure you can find 30 minutes of quiet time in your day? Click here for ideas and a worksheet to help you find time in your day. I promise it’s there – it just takes giving it a priority in your day. Make a plan for your time with God to make the most of your 30 minutes each day. Not good at new habits like this? Join the FREE 5 Day Challenge to Develop a Prayer Habit. In these 5 days of email-delivered lessons, you’ll get clear on WHY you want (and need) a daily prayer habit, as well as concrete plans for WHEN, WHERE and HOW you’ll pray. You’ll develop a prayer habit you’ll love (and keep). Be intentional about praying through scripture in this 40 day prayer course. Learn to pray through scripture, lectio divina, and Gospel contemplation with specific lessons, examples, and printable worksheets. Put the lessons into practice through the 30 day Power of Prayer devotional. 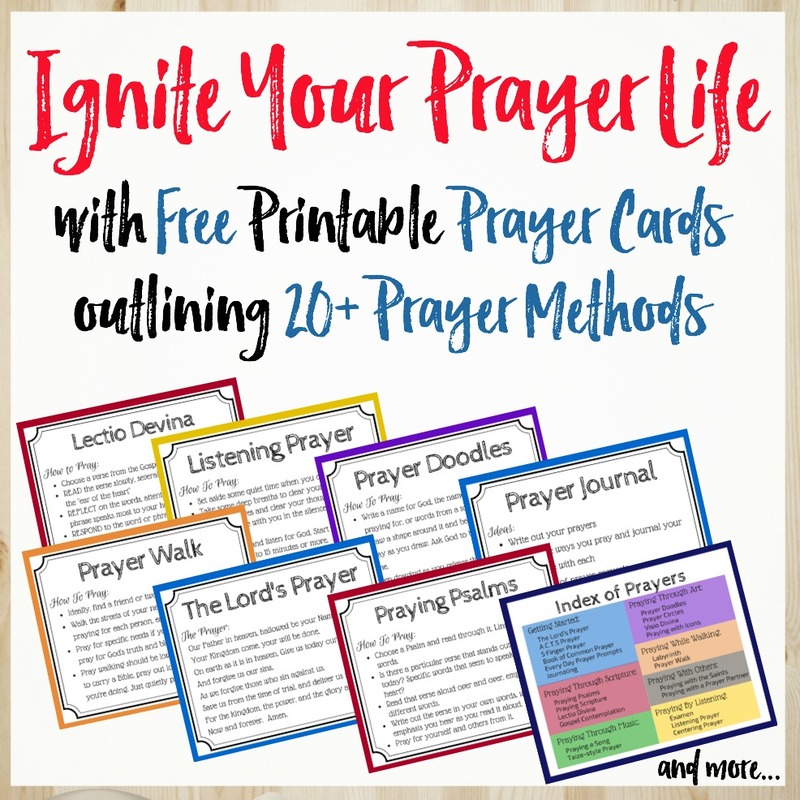 Each day explore the essence and power of prayer through mini-devotionals, scripture, and prayer prompts. Finally, walk with Jesus through his final week, fully immersing yourself in his death and resurrection through the 7 day Journey to the Cross devotional. Click here to learn more about Power Up Your Prayers. During this 40 day journey through the Lord’s Prayer, you’ll dive deep into each line of the prayer, learning to pray in more personal and profound ways. Over the course of eight weeks, you’ll pray through each line of the prayer, exploring various aspects of each. You’ll experience the Lord’s Prayer as never before, unlocking the power of this prayer and learning how to truly pray. Click here to learn more about Pray Deep: The Lord’s Prayer study.